I did sign up to follow your blog! and the giveaway box looks really fab! Looks like a fun giveaway! I'm a follower! I am a follower ;) Fun giveaway K! Can't wait to hear about the happy new space! Your giveaway pile looks much more exciting than my giveaway pile! Good Luck with the rest of your organizing. I know it can be quite daunting at times! I follow. Can;t wait to see pics. awesome giveaway, Keshet! As they say, one person's trash is another person's treasure =) I'm now a follower! what an awesome giveaway! I just signed up to be a follower! P.S. I am a follower now! now that is an amazing giveaway!!! Thanks for the chance!!! hey! i'm a follower too! good luck with the reorganization. i am in the midst of one too! great giveaway Keshet!! Good for you for organizing - I need to do it! Maybe after I win some goodies (haha)! I already follow you! What an awesome giveaway! Thank you for being so generous!! I'm now a follower of your blog! already a follower- thanks for the chance to win! :) also, jealous of your trip to hogwarts...i need to go there soon! Awesome giveaway Keshet. You know I'm a long time follower of your blog! Good luck with your reorganization. Amazing Giveaway! Thank you. Good luck with the rest of your organizing I just finished mine and it's so nice when it's done. WOW! You're giving away some AWESOME looking stuff. I just purged too so I may need some of that stuff. LOL I'm now a follower! PLEASE throw my name into the pile!! I love your blog! You've also inspired me to do some cleaning and purging in my scrap room.. I think I'll be able to breathe a lot easier! Hello and thank you for such an awesome giveaway box. It looks absolutely fabulous. I would be very honored if I were chosen as the winner. I am also a follower. I wasn't until this contest, but have been on your blog before due to Twopeasinabucket. I love what you do and it is always fun to stop in and check out what is happening in your neck of the woods. I've been reading your blog for quite a long time via google-reader, but just hit the button to follow your blog! I'm a follower !!! thanks for the super chance. My name is Talia and I'm from Israel. I've been a follower of your blog ever since I came across it and I love it! Your work is inspiring and I love your layouts! Continue scrapping with such enthusiasm and creativity! I'd be happy to win your box! Can't wait to see the finished scraproom Keshet!!! Thank you so much for the chance to win - I spy some cute SC stamps and other scrappy gorgeousness I would love to have! Oh such awesome scrappy goodness! Good luck with the reorganization! I am a follower!!! I'm already a follower for several months now. wow, keshet what a wonderful giveaway! i would love love love to win! Love to win... i'm a follower and a SC addicted !!! Hope your re-organization is going good for you! I'm a follower already and love reading your blog! I sooooo need to reorganize my stash, too!! Great idea! Spring cleaning a bit early, I love it!! Such a great giveaway. Hope to get Studio Calico staff. I'm a follower. Heaven's to Betsy's!! That's a very generous giveaway!! Good luck reorganizing; it's time consuming, and I swear I didn't look at my scrap room for a month afterwards! Well that could be due in part to all of my homework as well :( for shame. Well thanks anyways for the giveaway opportunity!! I've never purchased anything from Studio Calico or Scarlet Lime, but I have been eye-ing them from afar -online- for the last year and a half!! Maybe one day I will actually join, but till then it's okay to look right? longtime reader, but new follower. Can't wait to see your newly cleaned out scraproom! What a great giveaway! I would love to help you take some of that wonderful product off your hands! Wow, what an incredible fun pile of stuff. I would really like to win this!! What a great chance. Wow, what a generous giveaway. I haven't followed your blog, but I'm going to become a follower now. I found you from over on the SC forums. Thanks for an awesome chance to win! You are so very generous. that is quite a nice stash! I'm going to be super sweet, though... heehee...and tell you not to enter me in the drawing, only because I've already won something here, and don't want to be greedy on the rare off-chance that my name be drawn again. oh goodness-what a giveaway-thanks for the chance to win! Hi Keshet! What a fun giveaway! And of course - I am a follower! What a seriously fun giveaway!! 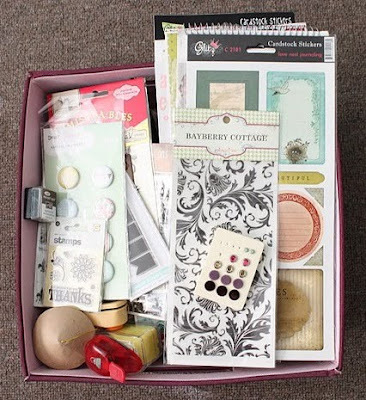 I am a follower of your blog :) Good luck on the scrap room re-do!! Can't wait to see your new scrappy space and all the loveliness you create in said space! I'm a follower, now ! Cool Blog - glad I found it ! As a fellow in-the-middle-of-a-reorg scrapper, I heartily appreciate your supply pile. Very impressive!!! You are so generous ! I wanted to say I'm so touched by your Heart is Broken LO. So much that happens (or not happen) in life is unfathomable. My hardest experience is still unscrapped - about my mom's death. Leave us some good hints on how to organize scrappy stuff. I read your blog regularly and continue to pray for HaShem to bless you and your husband with healthy children. What an awesome giveway. I wish I could organize my scrap space , but I have done it so much there is nothing left to do. LOL. Good luck with your space. Comments are closed now:) I will post the giveaway winner shortly!